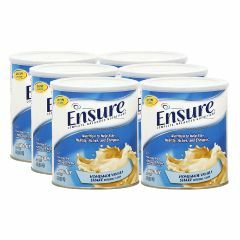 AllegroMedical.com presents The Ensure Powder - Vanilla. ENSURE POWDER is a source of Complete, Balanced Nutrition® for supplemental use with or between meals. It may benefit patients who have malnutrition, are at nutritional risk, experiencing involuntary weight loss, or on modified or low-residue diets. Reconstituted ENSURE POWDER should be used promptly or covered, refrigerated, and used within 24 hours. Corn Syrup, Corn Maltodextrin, Sugar (Sucrose), Corn Oil, Sodium & Calcium Caseinates, Soy Protein Isolate, Artificial Flavor, Potassium Citrate, Magnesium Chloride, Calcium Phosphate, Sodium Citrate, Potassium Chloride, Soy Lecithin, Ascorbic Acid, Choline Chloride, Zinc Sulfate, dl-Alpha-Tocopheryl Acetate, Niacinamide, Ferrous Sulfate, Calcium Pantothenate, Manganese Sulfate, Cupric Sulfate, Thiamine Chloride Hydrochloride, Pyridoxine Hydrochloride, Riboflavin, Vitamin A Palmitate, Folic Acid, Biotin, Chromium Chloride, Sodium Molybdate, Potassium Iodide, Sodium Selenate, Phylloquinone, Cyanocobalamin, and Vitamin D3. I will buy it next times. Good Value. Good Smell. Effective. Less effect with hot wate. I hope that this product can mix with hot water but it still keeps nutrition value.